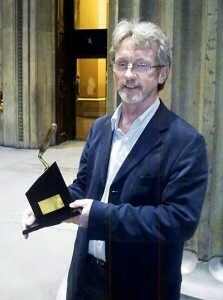 Nick Card at the British Museum with the Ness of Brodgar research project of the year award. 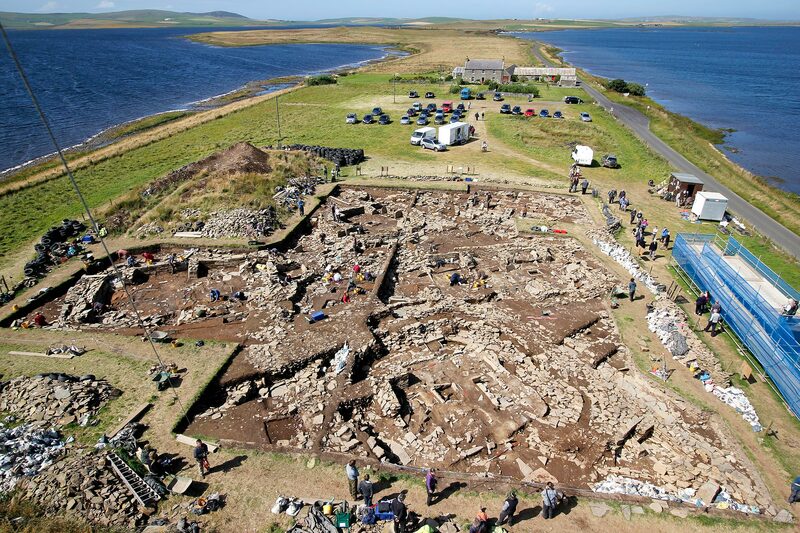 The ongoing archaeological dig on the Ness of Brodgar has been named research project of the year, in a national awards scheme. Excavations director Nick Card, senior projects manager at the Orkney Research Centre for Archaeology (ORCA), accepted the prize, on behalf of his team, at the Current Archaeology awards ceremony at the British Museum, in London, at the weekend. ORCA is based in the archaeology department at Orkney College UHI, part of the University of the Highlands and Islands. The Neolithic site on the Ness of Brodgar, contained within a large walled enclosure, lies between the stone circles of Brodgar and Stenness at the centre of the Heart of Neolithic Orkney World Heritage Site. Following the discovery of a large, notched slab during ploughing, in 2003, an evaluation revealed part of a Neolithic building with internal angular architecture very similar to one of the buildings at the nearby Barnhouse Neolithic Settlement. Further small-scale area excavations took place from 2004 to 2006. These investigations showed the extensive (circa 250m long by 100m wide) mound, where the site was located, to be largely artificial, comprising accumulations of Neolithic middens, structures and enhanced soils, associated with Late Neolithic pottery. Ongoing open area excavation, from 2007, is now revealing the full complexity and spectacular nature of the site. Mr Card said: “The discoveries at the Ness of Brodgar are dramatically changing our perceptions of this period of prehistory, as well as being built of incredibly sophisticated masonry — the walls of these temple-like buildings were lavishly carved and painted. Each summer, the excavations attract thousands of visitors from around the world. The Ness of Brodgar was runner-up in the Andante Travel Archaeology Awards 2008 and listed by the American Institute of Archaeology as one of the great discoveries of 2009. The excavations are supported by Orkney Islands Council, Orkney College UHI, the Russell Trust, the Robert Kiln Trust, Orkney Archaeology Society, Orkneyjar.com, Historic Scotland, numerous individuals from around the world, and the landowners Carol Hoey and Ola and Arnie Tait. Previous PostSo, it’s farewell from all of us. . .